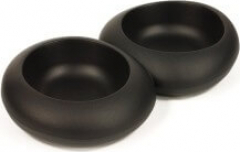 Boasting an elegant design, the CIOTTOLI double bowl allows you to properly feed your pet. This accessory is available in two colours and two capacities. The base is anti-slip for better stability. You can also put sand inside the bowls to give them more weight.